I’m an Oakland A’s fan, so with baseball entering the final month of its regular season, the race for a playoff spot is largely a theoretical construct. But other baseball fans who follow teams that still harbor postseason hopes may want to check out the latest update to MLB.com At Bat, released by Major League Baseball on Tuesday. 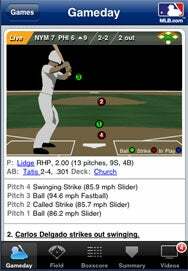 MLB.com At Bat delivers live scores and video highlights to the iPhone and iPod touch. In addition to box scores from completed games, At Bat also displays the current status of in-progress games—who’s batting, who’s on base, who’s pitching, and what the count is. The new Gameday view in MLB.com At Bat shows you who’s batting and what kind of pitches they’re facing. The 1.2 update released Tuesday figures to make that in-game data even more accessible by adding a mobile version of MLB.com’s Gameday feature. Gameday should be familiar to anyone who’s ever popped by Major League Baseball’s Web site to check out the score of a game. On the Web, Gameday displays the picture of the current batter and pitcher; below that, a field view shows the name of every fielder at the position they’re manning, with the names of any baserunners listed as well. The left side of the screen show’s the game’s boxscore, but you can also toggle between the batting lineups and video highlights of the game. Gameday’s main screen features a play-by-play summary as well as the location, speed, and type of each pitch thrown to the current batter. So how does this wealth of data translate to a mobile device? MLB.com has broken up the iPhone-friendly rendition of Gameday breaks the game-tracking feature into five separate screens. The Gameday screen shows the batter-pitcher matchup in graphical form, along with play-by-play and pitch data. Field view shows the names and positions of every fielder and runner—tap on a name and you bring up biographical and statistical info. Boxscore shows the running boxscore while Summary offers full play-by-play accounts and highlighted scoring plays. Videos taps into At Bat’s video highlights. The update is free to people who’ve already bought the $5 app.